Do you enjoy cooking for others? Are you the go-to person to cook for family events and holidays? You can turn that passion into profits by starting a home-based catering business. While there is no surefire recipe for a successful home catering service business, a dash of culinary skills, determination, and grace under fire can go a long way. Catering businesses can be run from home full or part-time, and earn between $30,000 and $80,000 a year, according to Shmoop. 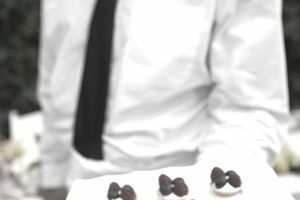 You can start small, catering events you can manage on your own or with a couple of helpers to see if a catering business is really something you want to pursue. Start-up costs depend much on how big you want to start, your state's requirements for selling food made from home, and what you already own to help you get started. On average, you can expect to invest $10,000 to $50,000 to get started, according to Entrepreneur.com. But if you start with small events, you should be able to open your business for less. Many catering start-ups succeed by conquering a niche; focusing on a particular food and/or certain kinds of events to keep overhead low and advertising focused. For instance, if you're expertise is in kosher food, you'd focus on Jewish events such as Bar Mitzvah, and promote through Jewish publications and other sources Jewish people would read. Other niche markets include family reunions, business or non-profit parties and events, and weddings. It's the perfect job for amateur chefs. It provides opportunity to advertise on the job -- potential customers are eating your food. The top 50 US caterers generate less than 15% percent of the industry revenue, according to a Business Wire article, meaning there's room for small operations. You can start small and grow, or stay small. A bad meal can generate bad word of mouth. Clients might make unreasonable demands or be difficult to work with. Mishandled food can guests sick, creating potential liability issues. Catering businesses require a great deal of organization and planning skills, plus a commitment to being on time. People are expecting you to bring food and service it. You can't not show up if you plan to have a successful business. Will you focus on a specific type of food or event? For example, will you just do cocktail parties? Will you cook on the client's premises or cook at home and deliver the meal? This could mean buying special equipment to keep the food warm or cold during transport. Does your state allow you to cater from home, and if so, do you need any special inspections or permits? Contact your state's occupational licensing agency or health department to find out what you need to do to be approved to operate a home-based catering business. Once you've determined the above, you should gather needed equipment and supplies. Most states that allow home-based catering have specific rules about food handling. For example, you may need to have a set of cooking utensils, pots, pans, servers, etc that are used for business only and not from your personal kitchen. The same may be true for food ingredients. In some cases, you might be required to have an entire separate kitchen. If you're ready to start cooking, here are the steps to starting your home-based catering business. Decide what type of catering you want to do. Contact your state occupational licensing or health department to learn what permits you need and any laws you need to abide by. Set up your business structure. To protect your personal assets from the business, consider setting up a limited liability company. Or, if you're working with someone else, set up a partnership. You'll need to name your business before setting up your business structure and getting licenses. Contact your city or county about obtaining a business license and obtain liability insurance to protect your business if someone gets sick. Write a detailed business plan. Create your menu. You can make your life easier by having a set list of items from which clients can mix and match to create their event menu. Buy professional cookware, dishware, utensils and other food-preparation and serving tool. Contact vendors to obtain your food and supplies wholesale. Give them flyers so they can promote your business to their customers.. Develop a system for collecting and responding to testimonials and referrals. Consider offering discounts for referrals.